When I spoke with Eliza a few months ago about some Church history topics that might interest historical writers, I mentioned the Virgin Cult. It began when Thomas and James, who were unable to attend the Blessed Mother’s burial, arrived and asked to see her body that they might recite the prescribed prayers. When the tomb was opened, rather than a decaying corpse, the smell of roses greeted the Apostles. Her body was gone, replaced by thornless, long-stem roses. And of course, her first apparition occurred to Saint James when he was evangelizing what is now known as Spain. So talk about a topic bigger than one can chew – that would be more than a book – more like a series of tomes! One thing that jumped out as useful topic to writers is something I employed briefly in one of my manuscripts (that will someday be purchased by some lucky house). That is Mary Gardens and other Sacred Gardens. Now even I will be the first to tell you, the Catholic Church didn’t invent these mediation retreats. We can go back to the Seven Wonders of the Ancient World to know they have been existence for quite a while. Recent excavation along the Scottish Lowland border of an old Celtic site shows evidence of what is believed to be a “prayer” garden. And Jesus was in a contemplative garden when he was arrested. The colors, the aromas, the peacefulness – all combine to lend a sense of serenity and otherworldliness that are, to this day, considered conducive to prayer and meditation. Mary Gardens are filled with flowers, plants and trees named for Our Lady, Jesus, and other holy people or places. They are designed to be a place of beauty that reminds one of our Lord and our Lady, allows one to experience God's creation, and invites prayer and contemplation. Because Mary is an archetype of the Church as Bride, the garden should be enclosed if at all possible, based on the words in the fourth chapter of Solomon's Canticle of Canticles: How beautiful art thou, my love, how beautiful art thou! Thy eyes are doves' eyes, besides what is hid within. Saint Benedict had a rose bush dedicated to the Blessed Mother at his monastery in the 4th century that still grows to this day and covers an entire side of the building. However, the first garden we know of that was specifically dedicated to Mary was created by the Irish Saint Fiacre in the 7th century. 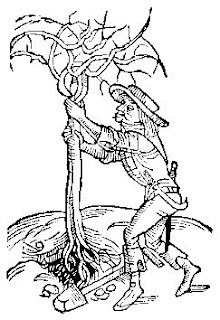 The earliest record of a garden explicitly called a "Mary Garden" involves a "fifteenth century monastic accounting record of the purchase of plants "for S. Mary's garden" by the sacristan of Norwich Priory, in England." Before the rise of Christendom, many flowers were associated with pagan deities – Diana, Juno, Venus, etc. When the Age of Faith ascended and superseded the pagan age, these flowers were christened and re-dedicated to Christian themes. So many flowers were named for Jesus, Mary, the angels, holy places, etc. – enough that you can create a garden focused on specific aspects of Mary and Jesus' lives, such as His Passion or her sorrows. Enchanting names, like "Our Lady's Tears" (spiderwort), "Christ's-Cross Flower" (Summer phlox), "Joseph's Coat" (Amaranthus), "Pentecost Rose" or "Mary's Rose" (peony), and "Our Lady's Mantle" (Morning Glory), abounded. During the Protestant rebellion and the rise of secularism, many of these flowers were re-named yet again with more worldly names. But, of course, these flowers still exist, and to many Catholic gardeners, their religious names are still meaningful. "Picture her eyes (Forget-Me-Nots), her hair (Maidenhair Fem), her five fingers (Potentilla). Think about her apparel: her smock (Morning Glory), her veil (Baby's Breath), her nightcap (Canterbury Bells), her gloves (Foxglove), and her shoes (Columbine). Remember her attributes: Mary's humility (Violet), the fruitful virgin (Strawberry), Mary's queenship (Virgin Lily), Mary's Flower of God (English Daisy), Mary's glory (Saint John's Wort), and Our Lady's Faith (Veronica). Think about her life: The Bethlehem Star (Bellflower), the Christmas Flower (Poinsettia), Lady's Bedstraw (Dianthus - Mary used bedstraw to prepare a bed for Jesus), the Epiphany flower (Chrysanthemum), the Flight into Egypt (Fig Tree - legend says that the Holy Family ate the fruit of this tree during their flight into Egypt), Our Lady's Tears (Lily of the Valley - tiny white nodding bell-shaped flowers can be likened to a train of tears), Our Lady's Tresses (Asparagus Fern - legend holds that at the foot of the cross, Mary, in. deep agony, tore out a tress of her hair which Saint John preserved), Mary's Bitter Sorrow (Dandelion), and the Assumption (Hosta - Plantation Lily blooms at the time of the Feast of the Assumption)." 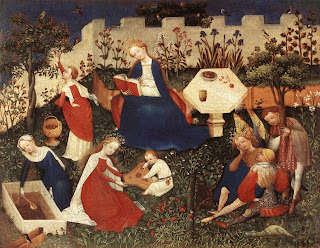 In medieval times, chatelaines planted flowers, plants, and herbs whose names and form evoked the Fourteen Stations of the Cross, the Fifteen Mysteries of the Rosary, the Seven Dolors of Mary, or any number of other religious themes, according to their patrons. Thus, by walking through their gardens, they not only enjoyed natural beauty, but practically "made the Stations" or "walked the Rosary," turning their gardens into a holy shrine (especially when accented with beautiful statuary). It was common for families without chapels to gather in their gardens for morning and/or evening prayers. Also, some of these plants had healing properties that were believed to be enhanced by their presence on land dedicated to God, because, of course, these gardens were blessed by priests. As time went on, these gardens became treasured spots. Nobles vied with each other to create the most extravagant outdoor paradises in honor of God (and themselves). The revival of labyrinths (a topic in itself) in the medieval period came about by these “unnamed contests.” However, the significance of the labyrinth in a garden from a Christian perspective is that there is only way to the heart of the maze, which signified Paradise, but many ways to get lost and land in Purgatory or Hell. For these complex gardens, nobles needed caretakers known as, you guessed it, gardeners. A few of the mazes in England today can be traced back to medieval origins. Over the years, I’ve developed a huge table with the modern name, scientific name and medieval names of many of the plants, flowers and herbs used to create these outdoor cathedrals. Knowing the medieval name lends a sense of time to any period fiction. If you want the medieval name of any you don’t see listed above, let me know. I’ll let you know if I’ve found it. So the next time your medieval heroine needs a place to escape where the hero can actually trap her, think of the enclosed Sacred Gardens – where I’m sure more than praying occurred. Great post again, thank you! Very interesting, Mary! Thanks for sharing! Thanks again for a fabulous post Mary! You're a wealth of valuable info! Wow, Mary, this is absolutely fascinating stuff. Love it. I designed my bedroom to resemble an enclosed medieval garden, your article has made me decide to add a another layer with the plants I put in it. Thank you for always interesting articles. What a fascinating topic, Mary! Thanks for sharing. That last line was a zinger, leaving much to the imagination! Thanks for this rich information! I'm writing a story set in Medieval times, and this gives me a lot of material to work with.